This is a list of United States territorial acquisitions and conquests, beginning with American independence. Note that this list primarily concerns land the United States of America acquired from other nation-states. Early American expansion was tied to a national concept of manifest destiny. The 1783 Treaty of Paris with Great Britain defined the original borders of the United States. It generally stretched from the Eastern Seaboard to the Mississippi River in the west. There were ambiguities in the treaty regarding the exact border with Canada to the north that led to disputes that were resolved by the Webster–Ashburton Treaty in 1842. Beginning in the late 18th century, the new nation organized areas west of the Original thirteen states into several United States territories, setting a template for future expansion. The Louisiana Purchase in 1803, was negotiated with Napoleon during Thomas Jefferson's presidency. The territory was acquired from France for $15 million (equivalent to $251 million in present-day terms). A small portion of this land was ceded to Britain in 1818 in exchange for the Red River Basin. More of this land was ceded to Spain in 1819 with the Florida Purchase, but was later reacquired through the Texas Annexation and Mexican Cession. West Florida was declared to be a U.S. possession in 1810 by President James Madison after the territory had declared its independence from Spain. Madison ordered the U.S. Army to take control. Six weeks later, the army entered and occupied the capital, St. Francisville, putting an end to the republic after 74 days of independence. Spain did not relinquish its claim to sovereignty (see West Florida Controversy) until ratification of the Adams–Onís Treaty. General Andrew Jackson personally accepted the delivery of West Florida from its Spanish governor on July 17, 1821. The parts of Rupert's Land and the Red River Colony south of the 49th parallel in the basin of the Red River of the North were acquired in 1818 from Britain under the Anglo-American Convention of 1818. The Adams–Onís Treaty of 1819 with Spain resulted in Spain's cession of East Florida and the Sabine Free State and Spain's surrender of any claims to the Oregon Country. Article III of the treaty, when properly surveyed, resulted in the acquisition of a small part of central Colorado. Webster-Ashburton Treaty of 1842 with Britain split the disputed territory in Maine and New Brunswick and finalized the border with Canada, including the disputed Indian Stream territory. In 1850 Britain ceded to the U.S. less than one acre of underwater rock (Horseshoe Reef) in Lake Erie near Buffalo for a lighthouse. Texas Annexation of 1845: The independent Republic of Texas long sought to join the U.S., despite Mexican claims and the warning by Mexican leader Antonio López de Santa Anna that this would be "equivalent to a declaration of war against the Mexican Republic." Congress approved the annexation of Texas on February 28, 1845. On December 29, 1845, Texas became the 28th state. Texas had claimed New Mexico east of the Rio Grande but had only made one unsuccessful attempt to occupy it; New Mexico was captured by the U.S. Army in August 1846 and then administered separately from Texas. Mexico acknowledged the loss of territory in the Treaty of Guadalupe Hidalgo of 1848. Oregon Country, the territory of North America west of the Rockies to the Pacific, was jointly controlled by the U.S. and Britain following the Anglo-American Convention of 1818 until June 15, 1846 when the Oregon Treaty divided the territory at the 49th parallel (see Oregon boundary dispute). The San Juan Islands were claimed and jointly occupied by the U.S. and the U.K. from 1846–72 due to ambiguities in the treaty (see Northwestern Boundary Dispute). Arbitration led to the sole U.S. possession of the San Juan Islands since 1872. Mexican Cession lands were captured in the Mexican–American War in 1846–48, and ceded by Mexico in the Treaty of Guadalupe Hidalgo, where Mexico agreed to the present Mexico–United States border except for the later Gadsden Purchase. The United States paid $15 million (equivalent to $403 million in present-day terms) and agreed to pay claims made by American citizens against Mexico which amounted to more than $3 million (equivalent to $81 million today). In the Gadsden Purchase of 1853, the United States purchased a strip of land along the Mexico–United States border for $10 million (equivalent to $301 million in present-day terms), now in New Mexico and Arizona. The territory was also bought as Americans were passing through the land west to California. After the American Mexican War, over the dispute of border claims, American bought the land to prevent future conflict. Few historians would argue the territory was intended for a southern transcontinental railroad. Alaska Purchase from the Russian Empire for $7.2 million (2 cents per acre) on March 30, 1867 (equivalent to $129 million in present-day terms), as a vital refueling station for ships trading with Asia. The land went through several administrative changes before becoming an organized territory on May 11, 1912, and the 49th state of the U.S. on January 3, 1959. The Kingdom of Hawaii was closely linked by missionary work and trade to the U.S. by the 1880s. In 1893 business leaders overthrew the Queen of Hawaii and sought annexation. President Grover Cleveland strongly disapproved, so Hawaii set up an independent republic, the Republic of Hawaii. Southern Democrats in Congress strongly opposed a non-white addition. President William McKinley, a Republican, secured a Congressional resolution in 1898, and the small republic joined the U.S. All its citizens became full U.S. citizens. One factor was the need for advanced naval bases to fend off Japanese ambitions. [citation needed] The Hawaiian Islands officially became an incorporated territory of the U.S. in 1900. Following 94% voter approval of the Admission of Hawaii Act, on August 21, 1959 the Territory of Hawaii became the state of Hawaii, the 50th state. With Hawaii came two remote coral atolls: the Palmyra Atoll which had been annexed by the U.S. in 1859, abandoned, then claimed in 1862 by the Kingdom of Hawaii, and the Stewart Islands, which had joined the Kingdom a few years before Palmyra. At Hawaiian statehood in 1959, Palmyra and arguably the Stewarts were excluded from the new state. Palmyra remained an incorporated U.S. territory, while the Stewarts were claimed and are now controlled by the Solomon Islands. Puerto Rico, Guam, and the Philippines (for which the United States compensated Spain $20 million, equivalent to $602 million in present-day terms), were ceded by Spain after the Spanish–American War in the 1898 Treaty of Paris. Spain relinquished all claim of sovereignty over Cuba, but did not cede it to the United States, so it became a protectorate. All four of these areas were under United States Military Government (USMG) for extended periods. Cuba became an independent nation in 1902, and the Philippines became an independent nation in 1946. This era also saw the first scattered protests against American imperialism. Noted Americans such as Mark Twain spoke out forcefully against these ventures. Opponents of the war, including Twain and Andrew Carnegie, organized themselves into the American Anti-Imperialist League. During this same period the American people continued to strongly chastise the European powers for their imperialism. The Second Boer War was especially unpopular in the United States and soured Anglo-American relations. The anti-imperialist press would often draw parallels between the U.S. in the Philippines and the British in the Second Boer War. Under the 1898 Treaty of Paris, Spain relinquished all claim of sovereignty over and title to Cuba, with the island to be occupied by the United States. Under the Teller Amendment Congress had already decided against annexation. Cuba gained formal independence on 20 May 1902. Under the new Cuban constitution, however, the U.S. retained the right to intervene in Cuban affairs and to supervise its finances and foreign relations through the Platt Amendment; this, however, was later renounced as part of Franklin Roosevelt's Good Neighbor Policy. Under the Platt Amendment (1901), Cuba also agreed to lease to the U.S. the naval base at Guantánamo Bay. The U.S. granted Puerto Ricans the right to democratically elect their own governor in 1948. In 1950, the Truman Administration allowed for a democratic referendum in Puerto Rico to determine whether Puerto Ricans desired to draft their own local constitution without affecting the unincorporated territory status with the U.S. A local constitution was approved by a Constitutional Convention on February 6, 1952, ratified by the U.S. Congress, approved by President Truman on July 3 of that year, and proclaimed by Gov. Muñoz Marín on July 25, 1952, the anniversary of the 1898 arrival of U.S. troops. Puerto Rico adopted the name of Estado Libre Asociado (literally translated as "Free Associated State"), officially translated into English as Commonwealth, for its body politic. In Guam, settlement by foreign ethnic groups was small at first. After World War II showed the strategic value of the island, construction of a huge military base began along with a large influx of people from other parts of the world. Guam today has a very mixed population of 164,000. The indigenous Chamorros make up 37% of the population. The rest of the population consists mostly of white Americans and Filipinos, with smaller groups of Chinese, Japanese, Koreans, Micronesians, Vietnamese and Indians. Guam today is almost totally Americanized. The situation is somewhat similar to that in Hawaii, but attempts to change Guam's status as an 'unincorporated' U.S. territory have yet to meet with success. The Philippine Revolution against Spain began in April 1896. The Spanish–American War came to the Philippines on May 1, 1898, when the United States Navy's Asiatic Squadron, commanded by Commodore George Dewey, defeated the Spanish Pacific Squadron under Admiral Patricio Montojo y Pasarón during the Battle of Manila Bay. On June 12, Philippine revolutionaries declared independence and establishment of the First Philippine Republic. On December 10, 1898, the Treaty of Paris which ended the Spanish–American War was signed. The treaty transferred control of the Philippines from Spain to the United States. This agreement was not recognized by the Philippine revolutionaries, who declared war against the United States on June 2, 1899. 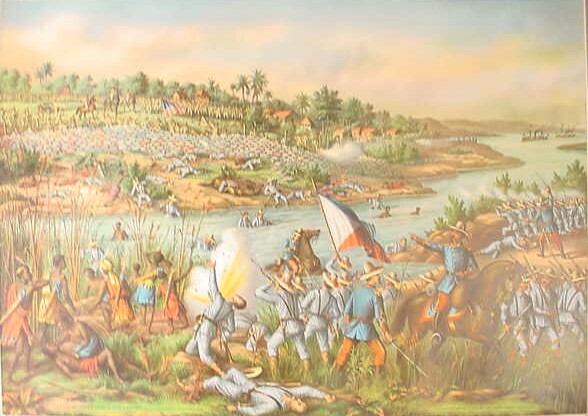 The Philippine–American War ensued. In 1901, Emilio Aguinaldo, president of the Malolos Republic, was captured and pledged his allegiance to the American government. The U.S. unilaterally declared an end to the conflict in 1902. Scattered fighting continued, however, until 1913. The Philippine Organic Act of 1902 provided for the establishment of a bicameral legislature composed of an upper house consisting of the Philippine Commission, an appointed body with both American and Filipino members. and a popularly elected lower house, the Philippine Assembly. The Philippines became a U.S. colony in the fashion of Europe's New Imperialism,[citation needed] with benevolent colonial practices. English joined Spanish as an official language, and English language education was made compulsory. In 1916, the United States passed the Philippine Autonomy Act and committed itself to granting independence to the Philippines "as soon as a stable government can be established therein." As a step to full independence in 1946, partial autonomy as a Commonwealth was granted in 1935. Preparation for a fully sovereign state was interrupted by the Japanese occupation of the Philippines during World War II. The United States suffered a total of 62,514 casualties, including 13,973 deaths in its attempt to liberate the Philippines from Imperial Japanese rule during the hard-fought Philippines campaign from 1944–1945. Full independence came with the recognition of Philippine sovereignty by the U.S. in 1946. Wake Island was annexed as empty territory by the United States in 1899 (the claim is currently disputed by the Marshall Islands). Germany, the United States, and Britain colonized the Samoan Islands. The nations came into conflict in the Second Samoan Civil War and the nations resolved their issues, establishing American Samoa as per the Treaty of Berlin, 1899. The U.S. took control of its allotted region on June 7, 1900, with the Deed of Cession. Tutuila Island and Aunuu Island were ceded by their chiefs in 1900, then added to American Samoa. Manua was annexed in 1904, then added to American Samoa. Swains Island was annexed in 1925 (occupied since 1856), then added to American Samoa. (The claim is currently disputed by Tokelau, a colonial territory of New Zealand.) American Samoa was under the control of the U.S. Navy from 1900 to 1951. American Samoa was made a formal territory in 1929. From 1951 until 1977, Territorial Governors were appointed by the Secretary of the Interior. Immigration of Americans was never as strong as it was, for instance, in Hawaii; indigenous Samoans make up 89% of the population. The islands have been reluctant to separate from the U.S. in any manner. The Annexation of Santo Domingo was an attempted treaty during the later Reconstruction Era, initiated by United States President Ulysses S. Grant in 1869, to annex "Santo Domingo" (as the Dominican Republic was then commonly known) as a United States territory, with the promise of eventual statehood. President Grant feared some European power would take the island in violation of the Monroe Doctrine. He privately thought annexation would be a safety valve for African Americans who were suffering persecution in the US, but he did not include this in his official messages. Grant speculated that the acquisition of Santo Domingo would help bring about the end of slavery in Cuba and elsewhere. Militarily he wanted a US naval port in the Dominican Republic which would also serve as protection for a projected canal across Nicaragua. On January 10, 1870 President Grant formally submitted Sec. Fish's Dominican Republic annexation treaty to the U.S. Senate. The treaty was stalled in the Senate until Sen. Sumner's Foreign Relations Committee started hearings in mid February, 1870. On 19 February, a referendum was held in the Dominican Republic, in which nearly 99% of the votes cast were in favor of the annexation. Sec. Fish noted that the Senate was reluctant to pass any measures initiated by the Executive Branch. Sen. Sumner allowed the treaty to be debated openly on the Committee without giving his own opinion. However, on March 15, Senator Sumner's Foreign Relations Committee in a closed session voted to oppose the treaty 5 to 2. On March 24, in another closed session, Sen. Sumner came out strongly against the treaty. Sen. Sumner opposed the treaty believing annexation would be expensive, launch an American empire in the Caribbean, and would diminish independent Afro-Hispanic and African creole republics in the Western Hemisphere. Grant met with many Senators on Capitol Hill hoping to rally support for the Treaty, however, to no avail. Grant refused the suggestion that the treaty drop the Dominican statehood clause. Finally on June 30, 1870 the Senate defeated the Dominican Republic Annexation treaty by a vote of 28 to 28. Eighteen Senators had joined Sen. Sumner to defeat the Dominican annexation treaty. The first United States occupation of the Dominican Republic lasted from 1916 to 1924. It was one of the many interventions in Latin America undertaken by the military forces of the United States. On May 13, 1916, Rear Admiral William B. Caperton forced the Dominican Republic's Secretary of War Desiderio Arias, who had seized power from Juan Isidro Jimenes Pereyra, to leave Santo Domingo by threatening the city with naval bombardment. From the start of the intervention until the US Marines withdrew in 1924, they were in almost continuous actions on both the squad and platoon levels, fighting numerous small-unit actions with elusive guerilla forces. Despite the ability of the Marines to bring a large amount of firepower to bear against the guerillas from both the ground and the air, the occupation troops had their share of problems as well. Sometimes the enemy would successfully ambush a lone Marine patrol, killing all or most of its members, and would scatter before reinforcements arrived on the scene. The Panama Canal Zone was an unorganized US territory located within the Republic of Panama. It was established under the Hay–Bunau-Varilla Treaty in 1903 and disestablished in 1979 under the Torrijos–Carter Treaties. Panama gained full control over the Panama Canal in 1999. A referendum on transferring ownership from Denmark to the United States was held on 9 January 1868 on the islands of Sankt Jan and Sankt Thomas, two of three main islands in the Danish West Indies. Of the votes cast, 98% were in favor of the transfer, but it never materialized. A second referendum was held in all three islands on 17 August 1916, once again with overwhelming support for the transfer. In 1917, the United States purchased the former Danish colony of St. Croix, St. John and St. Thomas, which is now the U.S. Virgin Islands. The United States—which had made an earlier approach in 1902—purchased these islands because they feared that the islands might be seized as a submarine base during World War I. After several months of secret negotiations, a sales price of $25 million was agreed. A non-binding referendum in Denmark held in late 1916 confirmed the decision to sell by a wide margin. The U.S. took possession of the islands on March 31, 1917 a few days before the U.S entered the war. The deal was ratified and finalized on January 17, 1917, when the United States and Denmark exchanged their respective treaty ratifications. The territory was renamed the U.S. Virgin Islands. U.S. citizenship was granted to the inhabitants of the islands in 1927. The Trust Territory of the Pacific Islands (TTPI) was a United Nations trust territory in Micronesia (western Pacific) administered by the United States from July 18, 1947, comprising the former League of Nations Mandate administered by Japan and taken by the U.S. in 1944. The various island groupings in the Trust Territory were later divided up. The Marshall Islands and the Federated States of Micronesia achieved independence on October 21, 1986. Palau did so in 1994. All three nations signed Compacts of Free Association with the United States. The Boundary Treaty of 1970 transferred 823 acres (3.33 km2) of Mexican territory to the U.S., in areas near Presidio and Hidalgo, Texas, to build flood control channels. In exchange, the U.S. ceded 2,177 acres (8.81 km2) to Mexico, including five parcels near Presidio, the Horcon Tract containing the little town of Rio Rico, Texas, and Beaver Island near Roma, Texas. The last of these transfers occurred in 1977. The Chamizal Treaty of 1963, which ended a hundred-year dispute between the two countries near El Paso, Texas, transferred 630 acres (2.5 km2) from the U.S. to Mexico in 1967. In return, Mexico transferred 264 acres (1.07 km2) to the U.S. The Rio Grande Rectification Treaty of 1933 straightened and stabilized the 155 miles (249 km) of river boundary through the highly developed El Paso-Juárez Valley. Numerous parcels of land (174) were transferred between the two countries during the construction period, 1935–1938. At the end, each nation had ceded an equal area of land (2,560.5 acres (10.362 km2)) to the other. In 1927 under the same 1905 Convention, the U.S. acquired two bancos from Mexico at the Colorado River border with Arizona. Farmers Banco, covering 583.4 acres (2.361 km2), a part of the Cocopah Indian Reservation at 32°37′27″N 114°46′45″W﻿ / ﻿32.62417°N 114.77917°W﻿ / 32.62417; -114.77917, was ceded to the U.S. with controversy. Fain Banco (259 acres (1.05 km2)) at 32°31′32″N 114°47′28″W﻿ / ﻿32.52556°N 114.79111°W﻿ / 32.52556; -114.79111 also became U.S. soil. Proposed: Based on aerial surveys in 2008, there are 138 cases where the widest channel of normal flow of the Rio Grande has shifted from previous surveys. Therefore, the International Boundary Line is to be changed under Article III of the 1970 Boundary Treaty. The result is 138 proposed transfers of territory that remain pending further evaluation and approval by the International Boundary and Water Commission and the two governments. Upon resolution, the U.S. is to cede 7 islands and 60 cuts in the Rio Grande to Mexico, totaling 1,251.2 acres (5.063 km2), while Mexico is to cede 3 islands and 68 cuts to the U.S., totaling 1,275.9 acres (5.163 km2). In 1925, to correct an unintended effect from an earlier treaty, the U.S. ceded to Canada two enclaves comprising two and one-half acres of water territory in the Lake of the Woods. The Northern Mariana Islands were part of the former Trust Territory of the Pacific Islands but decided in the 1970s not to seek independence. The Commonwealth of the Northern Mariana Islands in political union with the United States was established in 1978. The United States Military Government of the Ryukyu Islands (琉球列島米国軍政府 Ryūkyū-rettō Beikoku Gunseifu) was the government in Okinawa, Japan from 1945 to 1950, whereupon it was replaced by the United States Civil Administration of the Ryukyu Islands from 1950 until 1972. The United States Army Military Government in Korea (USAMGIK; Korean: 재조선 미육군 사령부 군정청; Hanja: 在朝鮮美陸軍司令部軍政廳) was the official ruling body of the southern half of the Korean Peninsula from September 8, 1945 to August 15, 1948. ^ "Treaty Text from the Avalon Project". Retrieved November 7, 2006. ^ a b Boggs, Samuel Whittemore (1940). International Boundaries: A Study of Boundary Functions and Problems. Columbia University Press. p. 48. Retrieved 2013-04-27. ^ "U.S. Insular Areas: Application of the U.S. Constitution" (pdf). Report to the Chairman, Committee on Resources, House of Representatives. United States General Accounting Office. November 1997. Page 39, footnote 2. ^ Miller 1984, p. 163 "... Will Show No Mercy Real Warfare Ahead For Filipino Rebels Kitchener Plan Adopted The Administration Weary of Protracted Hostilities.' The reference to Kitchener made eminently clear MacArthur's intent, as the British general's tactics in South Africa had already earned ..."
^ a b "Good Neighbor Policy". Retrieved 6 October 2014. ^ "Agreement Between the United States and Cuba for the Lease of Lands for Coaling and Naval stations". The Avalon project, Yale Law School. February 23, 1903. Archived from the original on June 27, 2007. Retrieved 2007-06-20. ^ "Treaty Between the United States of America and Cuba". The Avalon project, Yale Law School. May 29, 1934. Archived from the original on June 27, 2007. Retrieved 2007-06-20. ^ Constitution of the Commonwealth of Puerto Rico – in Spanish (Spanish) Archived 2011-11-14 at the Wayback Machine. ^ Constitution of the Commonwealth of Puerto Rico – in English (English translation). ^ International Boundary and Water Commission. "Minutes 144" (PDF). Archived from the original (PDF) on 2016-03-08. Retrieved 2015-06-12. ^ International Boundary and Water Commission. "Minutes 158" (PDF). Archived from the original (PDF) on 2016-03-08. Retrieved 2015-06-12. ^ Decisions of the Department of the Interior in cases relating to the public lands: 1927–1954. United States. Department of the Interior. Washington. For sale by the Superintendent of Documents, U.S. Government Printing Office. pp. 25, 337. Retrieved 2013-07-25. 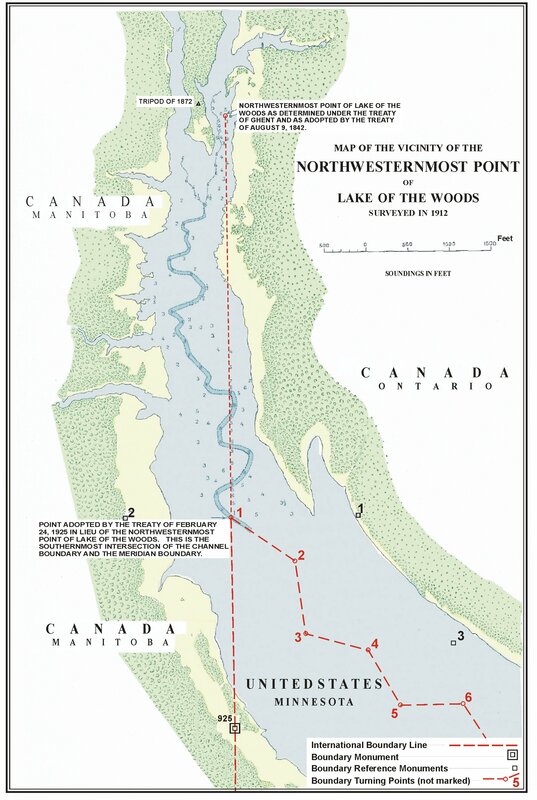 ^ "Map of the vicinity of the northwesternmost point of Lake of the Woods". Retrieved 2013-08-19. Bailey, Thomas A. A Diplomatic History of the American People (10th edition 1980) online free to borrow. "On the Coming Decline and Fall of the US Empire". transnational.org. Archived from the original on July 14, 2006. Retrieved 2006-07-30. "USA and Latin America". casahistoria.net. Retrieved 2006-07-30. History links to the early US involvement in Latin America from casahistoria.